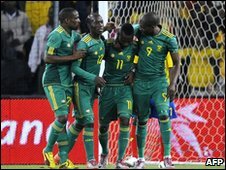 World Cup hosts South Africa celebrated their arrival in Johannesburg's Soccer City in fine style as they beat Colombia 2-1 on Thursday. A penalty apiece from Teko Modise and Katlego Mphela overcame Giovanni Moreno's spot-kick equaliser. The Colombians provided a real test for a team whose previous opponents have often lacked quality. The victory extends Bafana Bafana's unbeaten run to 10 matches under coach Carlos Alberto Parreira. "This was an important friendly against a very good side with experience and ten players in Europe," said the Brazilian. "They gave us a tough time but I'm proud - we fought, got a result and controlled the game at times." With the Latin American style helping South Africa prepare for Group A rivals Mexico and Uruguay, if not necessarily France, a Bafana Bafana side with Steven Pienaar, Benni McCarthy and Kagiso Dikgacoi on the bench started brightly. But hearts were in 75,000 mouths at a stadium hosting its first international when regular stopper Itumeleng Khune was clattered when repelling a dangerous cross - lying prostrate after being hit hard on both the head and hip. When both Khune and play resumed after a lengthy pause, South Africa instantly won a penalty after Siphiwe Tshabalala's inswinging cross was needlessly handled by Cristian Zapata. Local star Modise scored at the second attempt after 18 minutes after his first effort was saved by David Ospina, only for a re-take to be harshly awarded for the keeper's encroachment. Three minutes later, it was one-apiece as Khune rashly brought down Adrian Ramos after Colombia carved open the hosts' defence with worrying ease - the impressive Moreno converting the spot-kick. A lively encounter continued as Reneilwe Letsholonyane's low drive was tipped behind, before Jackson Martinez was denied in stoppage-time by some expert South African defending. Parreira changed things at half-time, bringing on Moeneeb Josephs for Khune and, more intriguingly, introducing a central midfield duo of Pienaar and Dikgacoi. "We're experimenting, it was Pienaar's first time there today and we have two more games to make up our minds," said the Brazilian. Just before the hour, Mphela reignited the match with a neat run which ended with the referee pointing to the spot for a third time after Tshabalala went down under little contact. This time, Mphela himself casually converted to net his third goal in as many games. Midway through the second half McCarthy made his first appearance since October but never threatened as Bafana Bafana slipped down a gear - Colombia finishing the stronger. Having been surprisingly kept on the bench until the 81st minute, Hugo Rodallega's arrival sparked a wave of attacks but Josephs made three fine stops, including a dipping 25-yard effort from the Wigan man. "Tonight was great, and the fan turn-out was magnificent," said McCarthy. "I'm glad I got on, got the feel of playing in this team again and we did what the coach wanted us to do." South Africa, who open the World Cup at Soccer City against the Mexicans on 11 June, finalise their warm-up against Guatemala in Polokwane on Monday and Denmark in Atteridgeville on 5 June. Meanwhile Senegal lost 2-0 to World Cup-bound Denmark on Thursday night. Denmark will face the Netherlands, Japan and Cameroon in Group E at the World Cup.